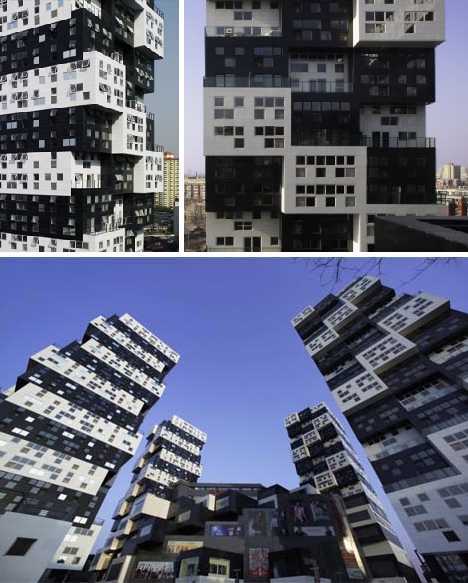 Call it “urban jungle lite.” BUMPS In Beijing is a 5-building, mixed residential and commercial apartment complex located in the Chinese capital’s prestigious Chaoyang District. 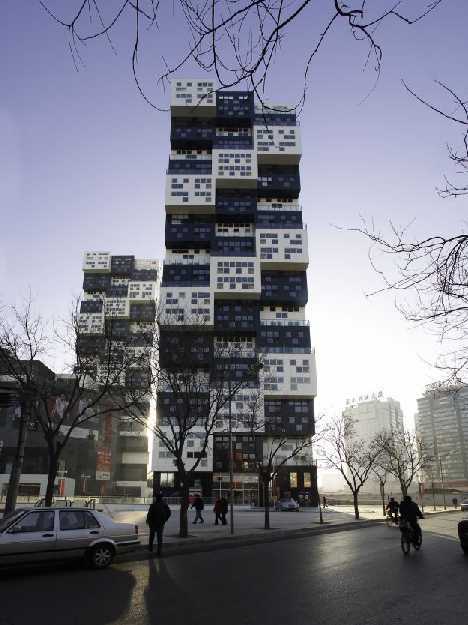 Japanese architect Keiichiro Sako’s neo-Metabolist “bumpy” design is a stylistic break from slab-sided traditional urban towers, providing optimum sunshine and breezy terraces that brighten up Beijing’s increasingly cramped skyline. 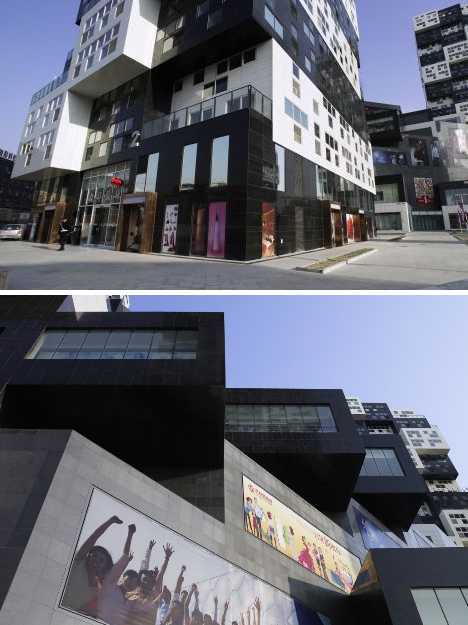 “BUMPS in Beijing”, a mixed-use, 5-building complex designed by Japanese architect Keiichiro Sako of SAKO Architects, is located in southwest Beijing’s desirable Chaoyang District. 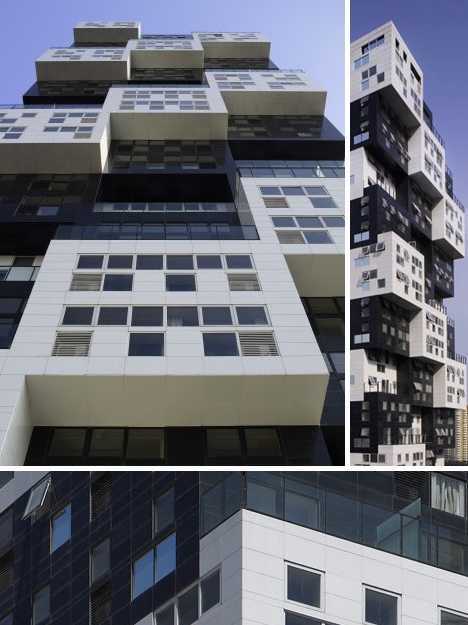 Even among a host of new and exciting highrise developments, BUMPS stands out – literally – thanks to its unusual stacked, staggered and yes: “bumpy” appearance. 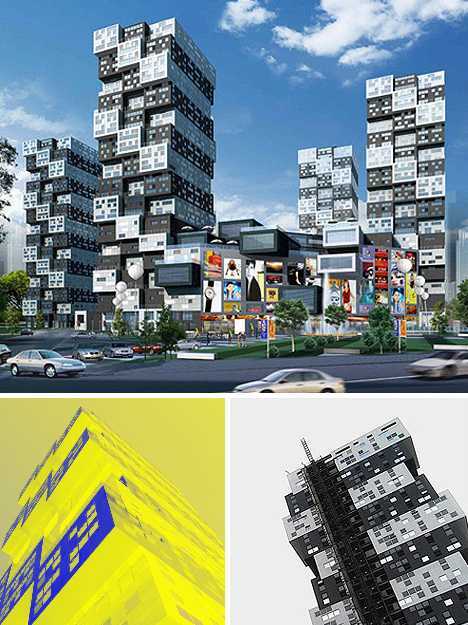 BUMPS consists of four residential apartment buildings, each standing 80 meters (262.5 ft) tall and set at the corners of an imaginary square. The fifth member of the complex is a centrally located 6-story commercial building with a restaurant occupying most of the top floor. 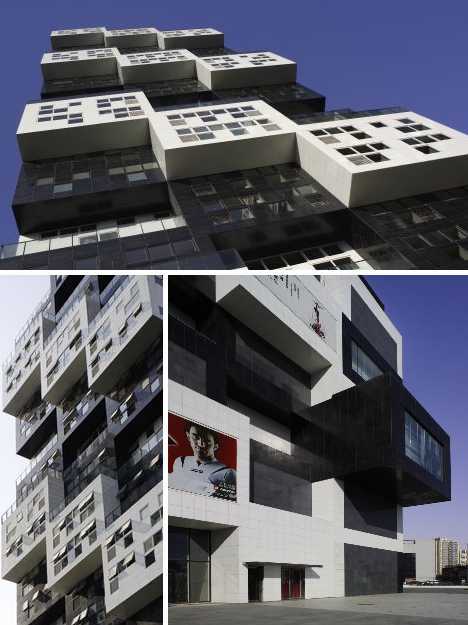 Right off the bat, BUMPS breaks with tradition by rotating the buildings’ footprints 45 degrees from the north-south axis. While seemingly unremarkable, one must consider that in Beijing almost all large buildings are oriented with a north-south plan. 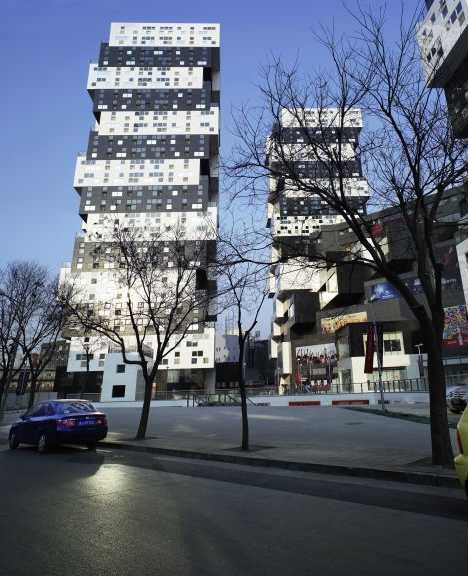 As Beijing is located north of the Earth’s equator, this means windows looking out of the north sides of these buildings will almost never catch direct sunlight. 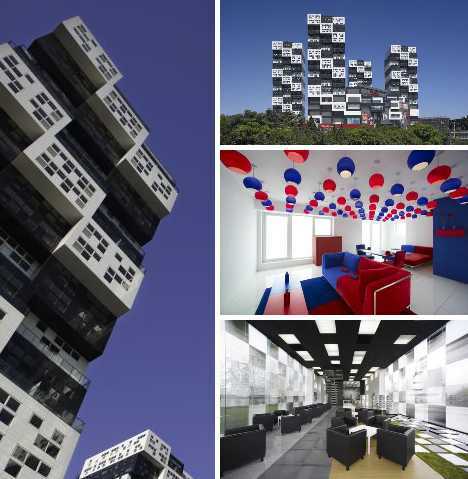 Sako’s design for BUMPS was predicated on “daylighting” – introducing as much natural light as possible into each apartment unit regardless of its position in the complex. The 45 degree twist immediately doubled the sunlit facings. 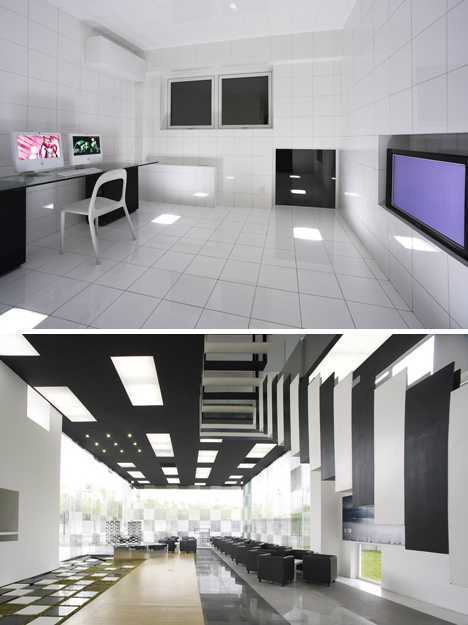 More ambitious was the staggered look of the individual apartment units and the visual effect the style imparted to the buildings as a whole. Looking at one of the towers, one can count 14 stories. Not so fast: each unit is made up of one white and one black module, with the upper section set back 2 meters (6.56 ft) from the lower. This allows each unit to offer not only an upstairs and downstairs, but an outdoor terrace as well. 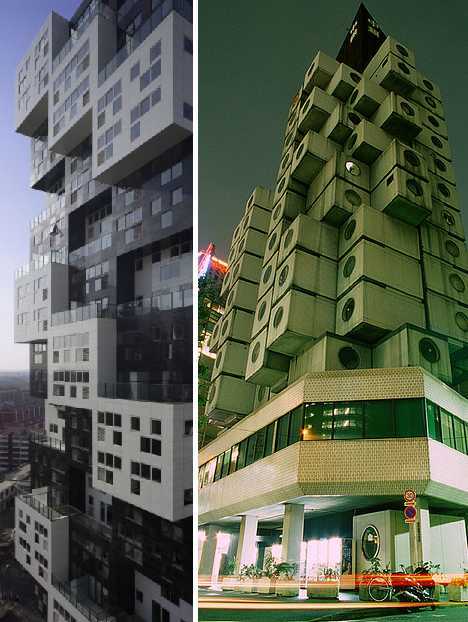 Repeated over the entire length, breadth and height of each tower, the series of setbacks gives the whole a unique modular appearance reminiscent of Tokyo’s famous Nakagin Capsule Tower (above, right) which actually WAS built from individual modules. 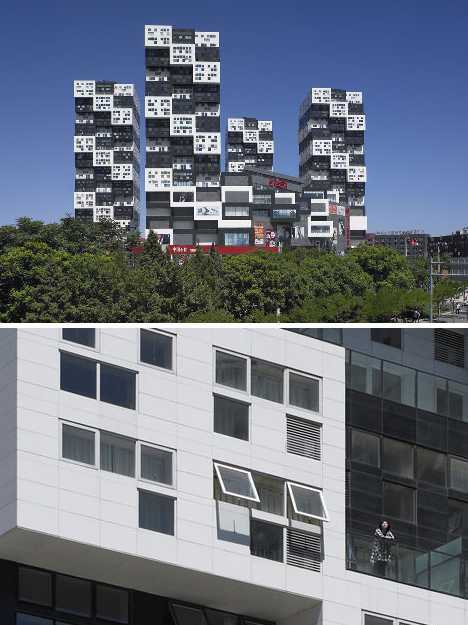 The bumpy, blocky, Jenga-esque facades of the BUMPS complex with their interspersed rectangular modules remind some of stacked black & white shipping containers, though nothing so bare-bones basic would have a chance of being approved for Chaoyang. In contrast to some other neighborhoods in overcrowded Beijing, Chaoyang today boasts wide green belts, mature trees and widely separated highrise buildings. On the other hand, what’s the deal with the bus parking lot? BUMPS lets in light through hundreds of 1-meter (3.28 ft) square windows. It remains to be seen if interior brightness levels will vary much from other designs offering floor-to-ceiling picture windows but it can be said, at least, that the wealth of identical square apertures add to the complex’s overall design aesthetic. 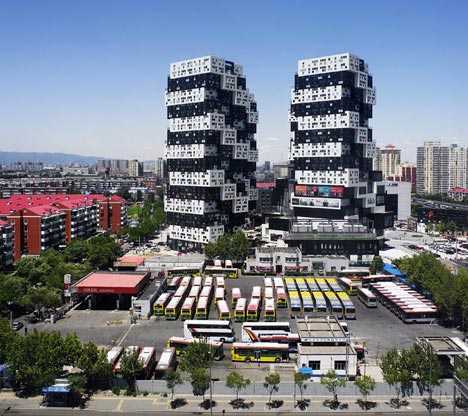 The total area of BUMPS is 103,218 square meters (1,111,065 sq ft), which befits its status as a landmark development Beijing urban planners are hoping will attract further projects to this part of Chaoyang. As always, the possibility remains that pressure from well-connected real estate moguls will result in overbuilding but at present, BUMPS literally stands alone as an urban island bathed in sunlight. Construction on BUMPS began in 2006 and by late 2008 the complex was ready to welcome its first residents. 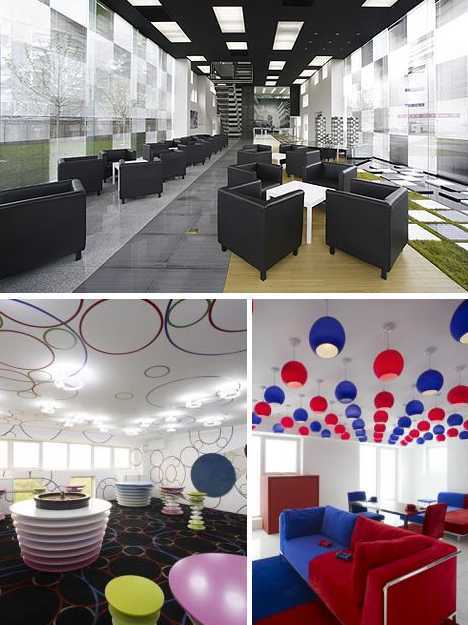 If these interior images are any indication, BUMPS offers an abundance of linear space with very few obstructions or obtrusive load-bearing walls. Daylight entering through southeast and southwest facing windows penetrates all the way to the opposite sides, potentially saving on interior lighting costs over time. 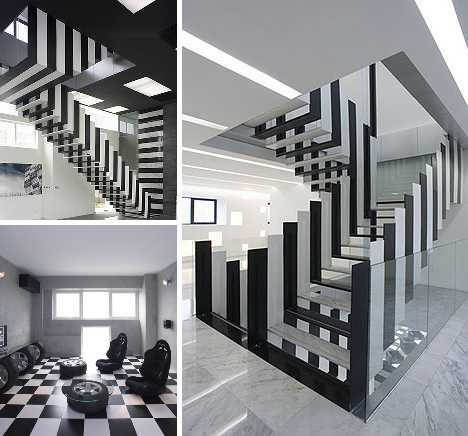 Staircases linking upper and lower halves of the units are distinctive in their own right, formed from U-shaped segments in alternating black and white that make up the stair treads and the handrails. 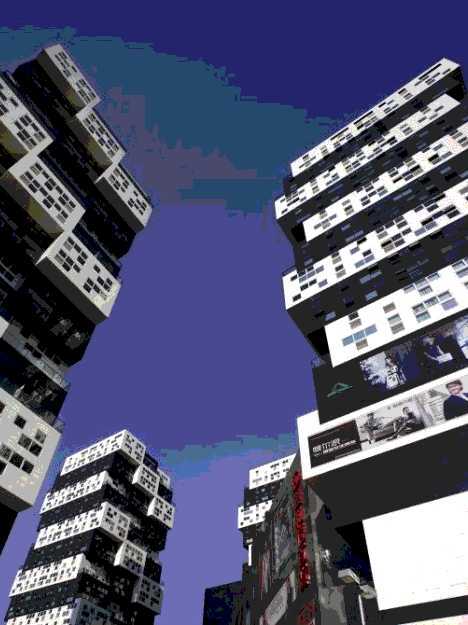 On the downside, some residents may feel put off by the long inside walls and complete lack of any curved surfaces. Sometimes, efforts to increase a sense of spaciousness can impart a feeling of smallness from the perspective of the beholder. Reactions of anxiety, even alienation, have bedeviled urban planners since the first modern highrise apartment blocks were built in the early 1950s. Only time will tell if BUMPS In Beijing will succeed on an emotional level the way it has as a pure design on paper. New kid on the block? We kid you not!